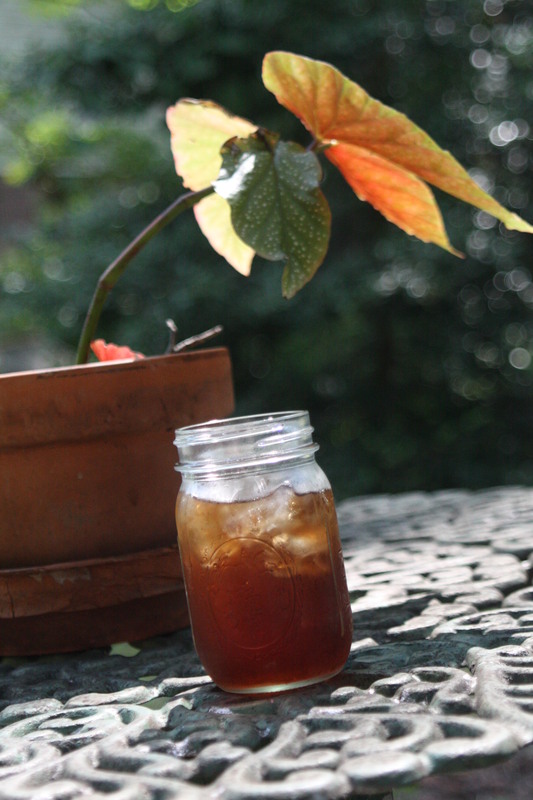 There are two quintessential Southern beverages – sweet tea and bourbon. We are fans of both here, so while there is almost always bourbon on hand, sweet tea tends to only be around during the summer months. I start making it at some point in May, storing it in my fiesta ware pitchers in the fridge, where it’s on hand until the weather starts demanding hot tea as an afternoon pick-me-up. My sweet tea has prompted more than a few native southerners to declare me an honorary southerner on behalf of all y’all. I grew up in Pennsylvania, but spent a good bit of my summers growing up visiting my father’s parents who had relocated to the hills of North Carolina. My Boston born grandmother never lost her accent, but her cooking style was purely southern, an influence of her West Virginia born husband. Growing up, we always had a pitcher of what was called ‘iced tea’ in the fridge. When I moved south to Auburn to go to college, I realized what I grew up drinking as iced tea was in fact, sweet tea. Over the years, I’ve adapted my mother’s recipe only slightly, as there is no need to mess with a good thing. 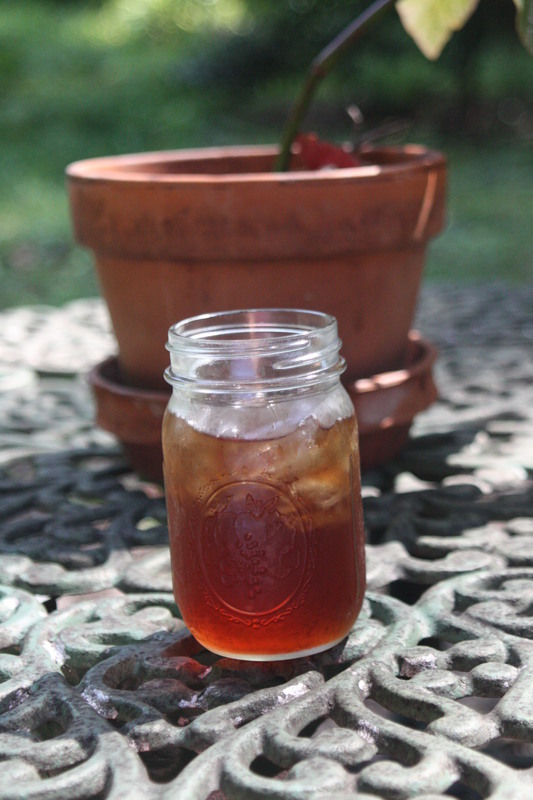 I get quite a few inquiries as to how I make my sweet tea every summer, which is why I’m devoting a blog post to it this summer. Because despite the start of school here, it is technically still summer, as seen in yesterday’s appearance of hot, muggy weather. Really, the first sign of true summer weather we’ve seen here since what, June? Way to show up late summer. Like my mother, I have a pot dedicated to the making of sweet tea. I recently traded in the pot I’d used since college for a new-to-me stainless steel copper bottomed pot that can do double duty in pickle making in a size not gargantuan. I’ve been on the hunt for a pot such as this for years, finally scoring it at a yard sale this summer. The same size as my last one, it holds about 6 quarts. I fill it with water and bring it to a boil. I then add two cups of sugar, stirring until it dissolves. I remove the pot from heat, drop in six Red Rose tea bags and let steep anywhere from an hour to overnight. (I prefer Red Rose to Lipton, which I know betrays my Yankee roots, but hey, try it and see for yourself. It’s a better tea.) Remove the tea bags, store in your fridge and serve over ice. It is the perfect beverage for a hot summer afternoon. Try it yourself and see. I read this just after bottling two quarts of iced tea (sweet and un-sweet). With temps and humidity both in the mid 90’s here in Atlanta today, Summer is still in full swing. I will give your recipe a try if I can find the Red Rose brand you referenced. Since you shared your recipe, let me share mine. For 1 gallon: 6 quart sized Red Diamond brand (two Pekoe varieties, I think) tea bags steeped in one gallon of boiled tap water in a stainless vessel which has boiled for a few minutes to remove impurities. Steep bags for 5 minutes and remove from tea. For sweet tea, pour over 1 cup of natural cane turbinado sugar and mix/let dissolve. Since I like my tea portable and fresh, I use recycled quart sized juice jars with a metal lid which will vacuum seal if you prepare them while the tea is still good and hot. If you want to play around with sweetness and savories, take a look at brown sugars, molasses, and cinnamon. I like dissolving the sugar in the hot water before steeping because it’s easier. I learned that trick from a fellow waitress back when we lived in Birmingham. It’s like using a simple syrup to sweeten, but the syrup becomes the tea. I do the same with kombucha, but don’t use as much sugar. I do sometimes use Red Diamond, although I always have Red Rose on hand because it’s my go-to hot tea as well. It can be hard to find – I’ve noticed I can’t find it at Kroger these days. I’ve never used Red Rose, but I do admit to adding a couple of orange tea bags to my regular ones when I make a pitcher of tea. That was the hot tea of choice of my parents, so it also got used in iced tea. The same is true of myself – it’s my hot black tea of choice. I do sometimes mix it up, but not often. I like Red Rose too. It really must be served in jars. Lovely! Full confession – when I moved into my first apartment some 25 years ago, I noticed a spare case of canning jars sitting in my mother’s basement. I grabbed it to use for drinking glasses and have never looked back. I think we are going to have a hot, miserable September as karma for our beautiful, cool August. Funny, my mom always used Red Rose to make iced tea, although hot tea had to be Irish Breakfast or Earl Grey. I grew up with Red Rose as iced tea and my mom liked it hot, but my dad was an Earl Grey guy, so we had it all. My mom is a die hard lipton drinker but mostly of the hot variety. I love some good iced tea! I like cold in summer and hot in the winter! Sweet tea is awfully lovely on a hot afternoon.